STUNNING! This designer block and stucco Live Oak/Lantana with LUSH LANDSCAPING on a QUIET CUL-DE-SAC in a beautiful part of The Village of Woodbury has ENORMOUS APPEAL both outside and in. OUTSIDE? 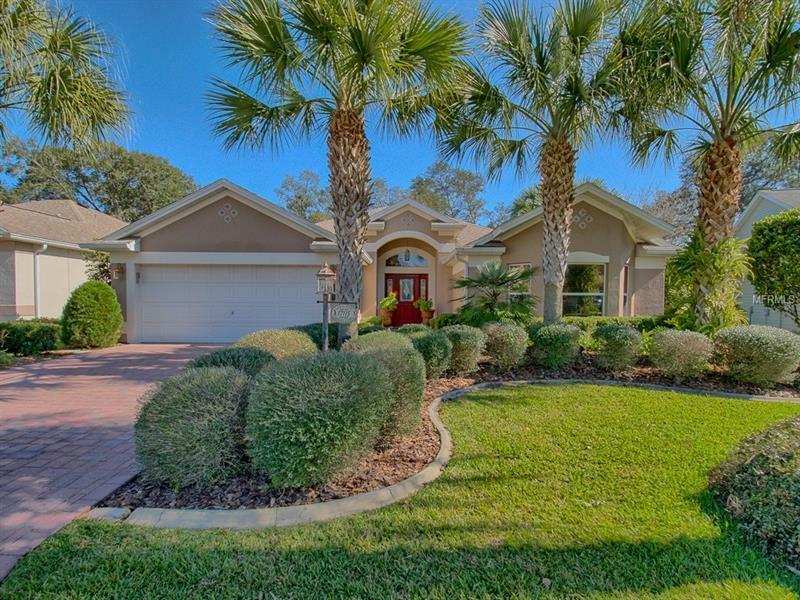 It's complete with driveway and walkway PAVERS, Curbit garden edging and gorgeous Florida landscaping surrounding the home, all of which is enhanced by beautiful ACCENT LIGHTING at night. INSIDE? Large dimension light neutral TILE FLOORS are featured throughout the home, with attractive carpeting in the bedrooms. The kitchen features beautiful glazed porcelain tile counters, back splash and breakfast bar, plus a much desired GAS RANGE/OVEN. The master bedroom comes with a large walk-in closet and a CUSTOM DESIGNED AND UPGRADED master bath. The Live Oak/Lantana floor plan has some EXTREMELY DESIRABLE STANDARD FEATURES, including the OPEN and SPACIOUS living, dining and kitchen areas, the LARGE BEDROOMS and the extra large laundry room. However, an additional very special âWOWâ factor of this great home is the WONDERFULLY PRIVATE and SUPER INVITING, expanded screened lanai (12 x 26) with TWO BIRDCAGES, all surrounded by ARBORETUM-LIKE LANDSCAPING. Finally, the BOND IS PAID and a Buyer's Home Warranty on all appliances and utilities is provided. This truly is a very special home.